Hey, everybody! Since I wasn’t able to get out this weekend and ride much, I spent a few hours at the computer with my favorite mug and some lemon herbal tea. It was time well spent, as I finally put together a summary of Felkerino’s and my Endless Mountains 1000K adventure! Felkerino and Me, first post-1000K ride together. We’re on singles, ha ha!! Felkerino and I set up our 2010 randonneuring season with the Endless Mountains 1000K in Pennsylvania as the pinnacle event. We rode a Super Randonneur series with the D.C. Randonneurs, and then logged various additional rides around the Blue Ridge in order to prep for our big three-day riding extravaganza. Two weeks prior to the Endless Mountains, I began to worry. I doubted my ability to finish a 1000K. I had only done one other long brevet (the Cascade 1200K in 2006), and it had been tough. While concerned about my riding abilities over a 1000K distance, I tried to keep my worries to myself, and pored over my activity log for the year. I calculated and recalculated the rides and miles to try to reassure myself that Ed and I were indeed ready. I knew the Endless Mountains 1000K would be hilly. The route profile showed over 44,000 feet of climbing over 622 miles. That gave me something else to spend my time worrying about. As fellow randonneur Joe Brown says, riding in Pennsylvania is somewhat similar to the D.C. Randonneurs rides, only the hills are steeper. Felkerino described parts of our ride like riding through terrain where somebody drove a gigantic fork through it, and you claw your way over where the tongs went. Hill after hill after hill. After hill. Are you getting the sense that the ride was hilly? While I fretted, Ed readied the bike. In particular, he purchased a set of Velocity Chukker rims for the tandem. According to Velocity, these rims are designed for “the trickster crowd, as well as for the bike polo crowd, and anyone else looking for a bit wider alternative to the tried and true Velocity Deep V.” I guess we fell into the third category, unless randonneurs could somehow be considered tricksters. We took the Chukkers out for a couple of pre-event test rides and they felt awesome. Stiff and sturdy! We’d had problems with wheels detensioning on us so we wanted to minimize the possibility of that happening again. Those Chukkers gave me confidence in our bike. And as my confidence in the bike grew, so did my belief in our ability to do the ride. Finally, we arrived at the Weisel Hostel in Quakertown, Pa., to check in with Tom Rosenbauer. What a relief! Our 1000K-day was finally here. No need to look at those log books and fret any more. Gary Dean, Bob Casciato, Felkerino, and I all grabbed pre-ride dinner together. As we caught up on each others’ summer riding, the topic of why randonneurs do what they do came up. And with that deep philosophical randonneuring discussion and dinner behind us, we all scurried off for a few hours of sleep prior to the 4 a.m. start. Day 1. Quakertown to Hallstead, Pa. 218.4 miles. Sleep came and went, and a few minutes before four a.m., Tom Rosenbauer gave the ride announcements and sent the 24-rider field off. It was a mellow, or perhaps still groggy, group that slowly rolled away from the hostel. I don’t recall much about the early few miles. We did miss a cue (our only miss on the ride, and our bad, as Tom put together a great cue sheet), but caught it quickly. A few miles later, I heard sirens. Then I heard more sirens and saw red lights. Oh no. A little later we came upon an accident. One of our fellow riders, George Swain, had been hit from behind. Ambulance lights were going. George was laying on the ground with the paramedics talking to him, about to move him onto a stretcher. Mike Lutz was on the phone with Tom giving him a run-down of the situation. A few other randonneurs were there, too. George’s beautiful Independent lay in the middle of the road, the rear end crumpled. His water bottles were strewn on the road, ejected from their cages, one in front of the other. The driver of the car that hit him was pacing and smoking a cigarette beside his car. It was awful. We were only 25 miles into the ride, and it was very hard for me not to ride back to the start. I spent a lot of the ride thinking about George, praying that he would be ok.
My next ride recollection is that of approaching and climbing Fox Gap at mile 62. Over this segment, I realized that Ed and I were not coordinating well. That is not a good thing when you are riding a tandem. He wanted to push a bigger gear than I did, and I was riding under the philosophy that I did not want to push too hard. We needed to pace ourselves to be able to ride strong for three days. Ed was determined to stick to his strategy, while I was just as determined to stick to mine. So that didn’t go very well. Fortunately, we had the Gourmet Gallery control at mile 82 in Blairstown, New Jersey, to give us a nice break. That place made the BEST sandwiches, and we saw a lot of other riders there. We rode out with Vytas Janusauskas, an Ontario randonneur, and spent much of the remaining three days in Vytas’s good company. The miles continued to pass and we spent the next stretch leapfrogging with Vytas, Mike Lutz, Bill Olsen, and Bob Torres. At one point around the century mark, I saw that Vytas and Mike had stopped at a roadside stand for some fruit. I told Ed, “That looks good,” and Ed kept pedaling. Grrr. Later, I asked Mike how the fruit was. He said it was wonderful. I’m still jealous! We controlled in at Port Jervis, New York, at mile 120 and kept on pedaling toward Hawk’s Nest on Route 97. Ed and I had ridden this section previously, en route to Niagara Falls. The Delaware River was on our left, and the mountains all around us. I got that great feeling of being “out there,” a million miles away from home and day-to-day life. It was awesome, and I began to settle into the ride. Ed and I had decided not to eat at Port Jervis and instead, to stop for dinner at the control at mile 147. That was too bad because it was closed. Fortunately, there was a post office nearby. While I couldn’t eat a meal there, I needed water and asked the woman working there if she had a place there where we could fill up our Camelbaks. She responded that she did not, but there was an artesian well right by the stop sign on the corner. Really? That was cool. “Oh. Right, sorry.” It still sounded great to me. We refilled, talked with a few other riders, and went in search of food, which didn’t come until Wallenpaupack at mile 160. We ate our convenience store dinner, talked with Gary Dean and Larry Midura, and guess what else. Pedaled onward! Soon after, we began the climb to Carbondale, Pa. Ed and I had synchronized our paces by this time, and we climbed strongly up the mountain. Ok, we did walk one short steep before the “real climb.” Shhh. Don’t tell anyone! The sun set, we kept climbing, and then bombed our way into the Carbondale Dunkin Donuts control at mile 185. Guy Harris, one of the great volunteers, was there to greet us and refill our water supply. We talked a little with the other riders; dined on sandwiches, hash browns, and coffee; and watched as more riders showed up. We left the control alone, and then climbed our way out of Carbondale. I had deluded myself into thinking that the last 35 miles of the day would be smooth sailing. Delusion is a good thing in randonneuring, I think, because if I had really known what the miles out of Carbondale were like I would have been in a really bad mood. We ground along for miles. It wouldn’t have been so bad, except that it was so dark and I was ready to be done for the day. I have decided that night riding is difficult for stokers because you really don’t see ANYTHING, unless you come across a house or a streetlight. And the next 20 miles didn’t seem to have much of either. Finally, we arrived at New Millford, Pa, mile 213. Ed and I stopped at the Minimart to gather ourselves for the final miles to the overnight. One of the staff came out to say hi to us and to say that she used to have a tandem. For her, it was completely normal that we were out riding our bike through her neighborhood at 11:30 p.m. I asked her what the terrain to Hallstead (our overnight control) was like. She said there was one hill, but that we would hardly notice it. Talking with her and taking a short break renewed my spirits and Ed and I started off again. Suicide Mountain was not up ahead and we had a pleasant final few miles to the control in Hallstead. Guy was there, as were volunteers Jim Logan and Dan Barbasch. It was 12:40 a.m. Sheesh. Oh well, I didn’t care, as long as I got some sleep. I said to no one in particular, “This is one BEEP-kicking ride,” Ed and I grabbed our drop bags, and ran off to shower and sleep for 2.5 hours. Day 2. Hallstead to Lewisburg, Pa. 218.7 miles. I was so proud of my bag drop system (and thanks, by the way, to the volunteers for dealing with our drop bags). I had put my outfit for each day in a separate Ziploc bag, and I divided up my pocket food in the same manner. No thinking required. All my brain cells could focus on pedaling and following the cue sheet, not figuring out what jersey to wear. We took off with a good-sized group at 4:15 a.m., and there we connected with fellow D.C. Randonneurs Scott Gater and Charlie Thomas (who rode the distance with Bob Bruce)… until they dropped the hammer. Ha ha! Do people drop the hammer on 1000K rides? No, they didn’t really drop the hammer. We stopped for gas station breakfast sandwiches and coffee. Bob Horner stopped with us, and a few minutes later Gary Dean came by. Gary (who was totally efficient at the stops) left after taking a short break, and I didn’t see Bob and assumed he had left as well. Ed and I did our traditional futzing around, and I went outside to wait for Ed so we could get going again. And there I learned that Bob H. was waiting for us. Thanks, Bob! Into the morning fog we went. It was a pretty ride to the next control, much of it along the river, and fairly mellow. Our next control was a post office in Tioga Center, New York at mile 261. We arrived, filled out our cards, took a short break, and continued through the quiet roads to the mile 289 control, a Dunkin Donuts in Towanda, New York. Ed and I made this control by 90 minutes or so, and that bothered me. I hate being on the button at controls. I felt like we had been riding well, feeling good, and digging into this ride as much as we could, but it wasn’t yielding the results I wanted. Grr. I was nervous about our proximity to the edge of the control windows and I talked with Ed about it. He said, “Mary, if we time out, we time out. We are doing the best we can and, at this point, timing out is mostly out of our hands. Until then, let’s keep going.” That was reassuring. No need to freak out yet! The section from Towanda up to the Heartbreak Hills (around mile 321) were challenging, although I learned a lot about what is going on in this part of the country. It was like being in a Transformers movie. There were big dump trucks and other truck traffic passing us fairly constantly. The roads didn’t have much shoulder, either, so that made it extra tricky. It took a lot of energy to deal with the traffic. We had to be extra vigilant about everything around us. Ed told me that this area was being heavily affected by hydraulic fracturing, or fracking. As a result, there is a lot of exploration being done in the hunt for natural gas. Big trucks that were never meant to ride on these two-lane roads are out and about all the time. I felt bad for the residents of this area, especially those living in the Heartbreak Hills, as it looks like a place where people deliberately choose quiet lives, outside the hustle and bustle. Now they have loud gigantic trucks clawing their way around the area. Yuck. Speaking of the Heartbreak Hills, that was some mighty tough riding. Grinding ups, followed by twisty downhills that surged back upward at a pitch that didn’t allow us to carry much momentum. The day was beautiful, though, as was the area, which made the climbing more bearable. After conquering the Heartbreak Hills, or rather, being conquered by them, we began a mighty descent that ultimately took us through Little Pine Creek State Park. At this point, I knew we would not time out at the next control and that the control windows would be more generous from this point until the end of the ride. Relief! Trees and greenery flanked us, the sun was warm, and the temperatures were perfect. It was a great day to be on the bike. The warmth of the day, combined with the comfort of knowing we would reach the control, relaxed me and made me drowsy. Really. Drowsy. Ed and I decided to take a 15-minute nap. We paused in a little town, I believe it was English Center, and found perfect napping spots near their community center. I didn’t think I had fallen asleep, until I heard Ed say my name, and I startled awake, disoriented. Oh right, we’re still on this bike ride. Great. Just then Vytas rode by. We had timed our nap perfectly! We kept each other company through Little Pine Creek State Park and on into the Watersville control at mile 359. I was sure that no one else would be there, but to our surprise we saw Mark Sheehan and Bob Horner. I wandered around the country store, trying to figure out what to eat. Ed had grabbed some potato salad, and it looked so good that Vytas and I copied him. As I was checking out, I told the cashier that I was sorry I smelled bad. She said, “That’s ok, you’re on a bike ride!” So I did smell bad, but it was an acceptable bad smell? Such is the glamourous life of a randonneur. Bill Olsen rode up as we were finishing our potato salad, and Vytas, Bill, Ed, and I rode the next 32 miles together. This stretch was beautiful. Water was on our right, and the mountain carved out to our left. It was gorgeous. Overall, the terrain on this section was very forgiving, too, which gave our legs even more recovery miles. As the sun began to make its big drop for the day, we reached the next control at mile 391 in Lamar, Pa. That was welcome, as Ed and I were both bonking. I didn’t realize how bad my need to eat was until I made my third trip into the bathroom, asking myself, now what did I come in here for? It’s a bathroom, how complicated can it be? We ate Subway sandwiches, and talked with Mark Sheehan and Guy. Mark put his head down on the table for another catnap, and we readied for the night miles. Our riding posse consisted of Bill O., Vytas, Bob H., Ed, and me. Bill and Ed thought there would be no major climbs in the final 47 miles. They are now corrected, as we had to go over not one, but two climbs before the “day” ended. The first climb was more gradual than the second, and seemed shorter, too. The full moon kept us company, lighting up enough of our surroundings to make it beautiful. Bill made me laugh because he was telling the group how, if you climbed this mountain during the day, you could hear the water and it was really quite pleasant. In fact, you could still hear the water at night, and I agree with Bill. The sound of it was lovely. On the second climb I learned a few interesting things. I learned that both Vytas and Bob do cyclocross. I learned that Bob’s wife doesn’t think Super 8’s are very glamorous places. Ha ha! Finally, I learned that sometimes, if you climb up long enough, you may also descend for a very long time. That’s what happened to us. 20 miles of descending, baby! It was like something you experience on the West Coast. Ed and I were certain that we would hit the overnight stop at 1 a.m., but thanks to that mighty drop, we arrived triumphantly into Lewisburg, Pa., just after midnight. Mostly triumphantly, that is. During the last two climbs, my knees had started to scream at me, especially the right one. As soon as we entered the hotel, we saw our friend and fellow tandem cyclist, Ron Anderson. Hi, Ron! The man working the overnight shift at the hotel saw us and rushed over to Ed to say, “I saw you ride in, and just wanted to tell you that she’s not pedaling.” Ba dum, Bum! People love those tandem jokes. I have no idea how long that man had held that joke inside of him, waiting and hoping for a tandem to roll into his lobby. We hung out for a while in the control room, and talked with Ron, Jim, and Guy. Ron gave us an update on George Swain, who had broken 24 bones in his body and was getting surgery while we were riding. I was glad to hear that George’s prognosis was good, but saddened by the extent of his injuries. After grabbing our drop bags, we made for our room, and repeated our previous day’s routine. Shower, prep for the next day, and a 2.5 hour nap. Day 3. Lewisburg to Quakertown, Pa. 184.3 miles. Morning came quickly. Sheesh! Fortunately, Ron had made some strong high-quality coffee to kick off our day, for which I will always think he is awesome. Thank you, Ron Anderson! At 4:30, Ed and I left the hotel alone and began our final day of riding. The miles to the first control were mostly quiet and had some big rollers. Or maybe they weren’t big, but at this stage of the game, they felt otherwise. The sun rose, bringing us into another perfect day, and we met up with more than ten other riders at the first control. It was a brevet breakfast party. After some gas station coffee and breakfast, Ed and I ventured back out on the course. The terrain and warm sun worked its magic on me again, and I started having problems keeping my eyelids open. We stopped at one of the local churches, and I took a catnap on the sidewalk, using my Camelbak as a pillow. Oh yes, this is the life! Ed said he would wake me up in 15 minutes, but I ended up not needing his alarm services. Bill and Vytas passed by, chatting (and pedaling!) enthusiastically. We hopped back on the tandem, and rode to the next control with them. Sometimes street names are excellent at telegraphing the next few miles. Our group enjoyed a rather forgiving climb up “Gap Street.” This was followed by Molleystown Road, which was also a climb, and where Ed and I had our first and only tandem team meeting of any significance. I did not agree with the way Ed had pedaled through the intersection. Ed thought that I was telling him to turn right, which was not what the cue sheet indicated. Looking back on it, this does not seem like anything that would warrant a tandem team meeting, but after riding 488 miles, it’s not just your rear end that gets a little frayed, ha ha! We stopped for a second to regroup and Vytas rolled back and asked, “Is it time to get out the hacksaw?” Ed and I informed Vytas that a hacksaw would not be necessary, as our bike has couplers, and we only need a special wrench. We concluded our meeting and descended to mile 491.5 in Pine Grove. The Pine Grove stop was full of riders finishing their second breakfast and stashing their reflective gear. We spoke briefly with Christine Newman who said that someone had openly laughed at her outfit in the bathroom. She looked good to me, but I guess not everyone is a fan of randonneur fashion. As Vytas, Ed, and I readied to leave this control, another rider rolled into the stop. He seemed happy to see us, and wanted to talk. We wondered if there was a randonneur out there who we might have missed. We realized that he was on his own ride, and Vytas informed the rider that he was too clean to be riding with us. Ha ha! We asked the rider where he was headed and he said he hoped to do around 140 miles or something. Of course, that did not impress us because we were riding 184 miles for the day, after having ridden a kerpillion miles already! We faked being impressed, though (politeness is a randonneur virtue), wished the rider “Bonne route,” and carried on. The section to the next control had me a little worried because people had mentioned that we would soon “cross the Appalachian Trail.” To me, that is code for “climb your brains out.” However, except for one mighty, but short, steep, the ascent was quite manageable. It also came with a nice payoff, as the view from the Appalachian Trail was excellent. It was another “out there” moment. We were at the highest point in the area, and all around us was blue sky, greenery, and descents. Yay, descents! We cruised our way in and out of the control in Jonestown, Pa., mile 508. We caught up to Bob Horner, who would ride with us the rest of the day, and a few other riders. The landscape in this section was rolling and the route felt rather drunken sailory, as we meandered down one gently winding road to the next. This is also the section where Bob discovered the secret power elixir of GU powder and Mountain Dew. He was very excited about this discovery and many of the miles to the post office control were spent discussing Bob’s new drink of choice. Apparently, Bob felt it was unlocking all his energy reserves. Our group thought he was a little crazy, and definitely a risk-taker for going into uncharted fueling waters on a 1000K. Bob said, “On these rides, it always seems that I try one new thing that doesn’t work, and one thing that does.” He was quite pleased that the GU plus Mountain Dew was so successful. I don’t remember what he tried that had failed. I thought about what Bob said, and found myself agreeing somewhat. I often will try one new thing on a long ride, even though common sense tells me that a long ride is not the optimal time to do it. For this ride, I had thrown in a pair of cycling shorts that I had never ridden in any longer than 50 miles, and crossed my fingers. They ended up being AWESOME! I only tried one new thing, though, so I lucked out that it went well. On the other hand, Vytas mentioned that he had varied from his normal routine by deciding to carry lots of Clif bars. He had tried one on a ride recently, thought they tasted good, and added them to his 1000K nutrition plan. By the second day, he was rethinking that decision, and as the third day progressed his disdain for the Clif bar increased dramatically. 1000K changeup fail! Ed and I spent many of the next 50 miles riding with or around: Christine Newman, Bill Olsen, Mike Anderson, Bob Torres, Bob Olsen, Bob Horner (lots of Bobs on this ride! ), Jon Clamp, and Vytas. Scott, Charlie and Bob Bruce were always getting ready to pull out of the control as we were arriving. Pedaling with or near so many other riders helped the miles pass and made the day feel festive. We stopped at the post office control in Mt. Aetna, Pa., and I can’t remember when I had so much fun in a post office parking lot. It’s one of my favorite memories of the event. Everybody hung out together for several minutes, and no one seemed rushed. We enjoyed a bit of civility by just standing and talking, and then off we all went again, back on this mad crazy adventure. The next section was a slog. The miles were pleasant, but Ed was drowsy. We pulled over with Vytas, Bob H., and Bob T. I grabbed some potato chips, and Ed napped on the curb. Closing the eyes for a few minutes helped renew Ed, and our group made its way to the Turkey Hill control at mile 548 in Brownstown, Pa. That stop was even more fun than the post office. It was a 1000K party, as at least 13 riders converged here. Per usual, Charlie, Bob B., and Scott were just getting ready to roll out. This time they were with one other rider, who I believe was Ernest Landry. I snapped my obligatory control photo of Charlie, Bob, and Scott, and ran inside to see what convenience store delicacies awaited me. I chose a chocolate chip cookie ice cream sandwich, and snagged a spot on the curb. We must have been quite a sight, all of us scattered along the curb, with our bikes resting against various parts of the convenience store itself. Andrew Mead was there doing a headcount (also looking very clean, compared to all of us, who were beginning to look pretty scruffy) and we enjoyed talking with him and finding out where others were on the course. He took some great shots of the group at this stop, too. Thanks, Andrew! I spoke with Bob Olsen, who mentioned his neck was starting to give him problems and he was having indications of the onset of Shermer’s Neck. He even bought bungee cords here and that sort of freaked me out. We joked around about us switching places on our bikes. I would ride Bob’s single, and he could just prop his head on Ed’s back in my stoker spot. That would just blow the ACP officials’ minds, we thought. 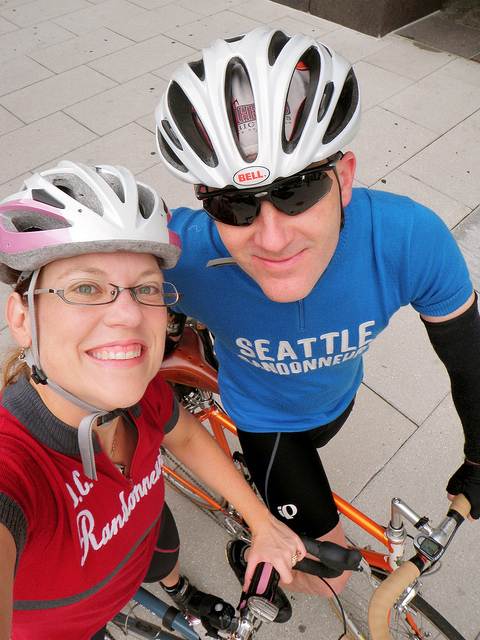 Ultimately, we did not switch bikes, and we set out pedaling yet again. (Unfortunately, Bob did get Shermer’s Neck, but was able to finish the ride with Bill Olsen and Christine.) Our new riding posse consisted of Vytas, Bob H., Mike A., Jon, and Bob T. Soon after leaving town we ran into a local rider who thought it was just awesome that we were out riding on his regular evening riding loop. He asked us about our route, and talked with us about the area. We were riding through Lancaster County, which is Amish country. Our fellow cyclist told us that if we saw a black horse-drawn buggy, it was Mennonite, and that a gray buggy indicated it was Amish. This was the educational part of my ride, in addition to Bob’s GU plus Mountain Dew portion. Our local rider ultimately took a left, and we took a right to head toward Morgantown, Pa. This section was full of lots of tobacco. Tobacco may be bad for your health, but it is a beautiful crop, with big green leaves. We passed one white barn where we could see they had hung the leaves to cure. Gorgeous. As we approached Morgantown via Weaverland Road, the traffic picked up and it got a little crazy. Cars and trucks were making their way to their late-afternoon commitments, and several Amish buggies (gray, see, I remembered) were out and about as well. Throw the cyclists into the mix and it was two-lane highway overload. The cars were impatient with the varying forms of slow-moving traffic and we heard brakes squeal around us a couple of times. Stressful! I felt a wave of bleariness and my demeanor descended into general poor spirits. Ed wanted to push on past Morgantown without stopping, but I told him I needed a break. He wasn’t thrilled about the idea, but he stopped at a store just outside of Morgantown. The rest of our group stopped with us, which made me feel better about stopping. I went inside, but couldn’t find the potato chips. I walked around looking and looking. “Ed, I looked all over. I can’t find the potato chips. Where are they?” I was fighting tears. Yes, they were. I had really been bonking! Our group ate our treats and talked. Vytas noted that Clif bars were like a Swiffer for your mouth, soaking up every last drop of saliva in it. He really had strong feelings about these Clif bars! Stopping for a non-Clif-bar snack did wonders for my morale and my energy level. I felt so much better. My disposition was a lot like the ride. Sometimes I was thinking this was the best thing ever and I was ascending to new randonneuring heights. Then I would despair and think this was one of the silliest summer plans I had ever made. Still other moments, I rolled contentedly along, not thinking too much about anything. Yes, just as the ride had over 44,000 feet of climbing, I believe I experienced approximately the same number of mood swings. The miles to the next control were tandem-friendly, and we had an awesome time on this section. We enthusiastically pedaled our way through beautiful rolling terrain along back roads in the afternoon sunset. There were a couple of perfect rollouts where the tandem approached 55 miles per hour. Jon said that we moved “like a rocket.” Yeah, baby! As we rode and talked, Bob H. said that Ed and I should get special privileges because of our exclusive tandem status. People do love to see tandems. They smile at them. They wave at them. They point and yell cute things at them. “Look! A two-people bike!” “Who does all the pedaling?” You get the idea. However, while the terrain itself was tandem-friendly, the people were not. Our tandem magic did not work here. Ed and I would pass by people’s houses, I would wave, and no one would even look at us. They did not care about our tandem awesomeness. We all had a good laugh about that, and pedaled our way to the next control, in hopes that the residents of the next town would be more into our tandem and pay attention to us, ha ha! As the sun was going down for good, we arrived at our penultimate control in Limerick, Pa. Tom Rosenbauer was there to greet us and Charlie, Scott, and Bob were (you guessed it) getting ready to roll out. We had covered 592 miles and, with the exception of my right knee, I felt good. A sandwich and a cup of coffee later, and I felt even better. Bob Torres said that as long as we maintained a 3.1 mile per hour pace, we would make the cutoff for the ride. Hearing that comment exponentially buoyed my confidence about finishing. I came down with a terrible case of the sleep deprivation randonneur blabs at this control. I could not stop talking! Blah blah blah! Blah blah blah! I told Jon I was sorry I couldn’t stop talking, I just couldn’t help it. Then I kept talking. I asked Tom what the final miles would be like, and he said they would have little traffic, but it was full of steeps. I was glad to have been forewarned that it would be a slog. It did not disappoint. We twisted, turned, and climbed our way back to Quakertown. My knees were shouting at me, but I tried to ignore them. Be quiet knees, I’m working here! Ed and I were the lead navigators for the final miles. Fortunately for the group, this helped to quell my sleep deprivation randonneur blabs, since I had to devote all my concentration to the route. Except for the ascending, where we were the slowest of our fellow riders, it made sense for us to lead. Ed had the GPS, and I could focus solely on the cue sheet, given that I had no steering responsibilities. We thought maybe some in our group would want to push on ahead, but they seemed content to ride the final miles in with us. Thanks, guys! In the last fifteen miles, Bob H. and Jon did ride ahead of us for a little bit. They decided it would be exciting to attack each other on the climb up to the Finland Inn. It was pretty funny to watch, and I loved that even after riding 610 miles, nobody had lost their senses of humor. After what felt like forever we reached our final control, the Weisel Hostel in Quakertown. It had taken us over 2.5 hours to ride the final 30 miles. We didn’t set any speed records, but our group of six had stuck together and completed the final stretch without missing a cue. Overall, it took us 67 hours and 37 minutes to traverse 622 miles and pedal right back to the place we started. That’s the brilliance of randonneuring. Volunteers Christiane and Gilbert Torres were at the finish to cheer us in and make us official ride finishers. Thank you! I was enveloped in euphoria and my sleep deprivation randonneur blabs returned with a vengeance. I’m not sure how I managed to eat my bowl of chili, given all the talking I was doing. Overall, Ed and I had an excellent ride. I still love him and think he is the best tandem partner ever so I consider that a brevet success! We prepared as well as we could, both mentally and physically, for the terrain we encountered. And even though the course was difficult, it relented in places, and we were able to use that terrain to recover and prepare for the next challenging sections. The course has some incredibly beautiful parts, and it is evident from the cue sheet to the volunteer support that Tom puts great care into his events. Services were not as plentiful as I imagined they would be and we subsisted mostly on gas station food. That was OK. It’s a natural outcome of riding in rural countryside. I was glad that I pre-packed a fair amount of pocket food for each day. The group experience on this ride was outstanding. Ed and I had the chance to ride with many of the other riders at different points on the ride, and I never felt strung out. There were always people around us, and that helped the miles pass. Thanks to everybody who kept us company on the ride. My heart is still heavy about what happened to George. His accident reminds me of our fragility, as well as our resilience. I hope his recovery continues to go well. When I finished the 1000K, I told Ed that this would be the last ride over 600K that I would ever do. EVER! Now a little time has passed, my knee pain has ebbed, I’ve caught up on my sleep, and the sense of accomplishment and good memories of the ride have surged to the forefront of my mind. It’s that randonneur amnesia kicking in. Maybe I’ll do another 1000K someday. Just maybe.